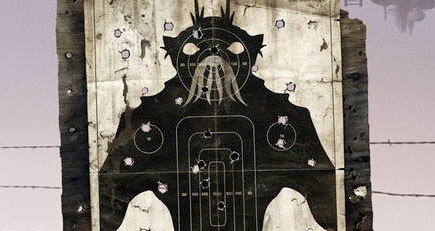 Its been a couple of days since I saw District 9, and I’m still figuring out how I feel about it. Its a rough movie. Rough in its presentation- the jerky view point of the hand held cameras, the lack of slickness. Rough in its structure – the way it moves without warning from the mock documentary style into more conventional story telling. Rough in its subject matter – the moral dilemmas, the resonance with our Apartheid past and Xenophobic present. And rough in its violence. This is a difficult movie to watch. I was reminded of Starship Troopers, which also had any number of insectile alien bits spraying around the screen. But unlike Starship Troopers, which had a pretensions to an ironic message, District 9 asks some honest, difficult questions. Some pretty bleak questions. Are humans capable of empathy? When it comes right down to it – can we look past the surface of difference? 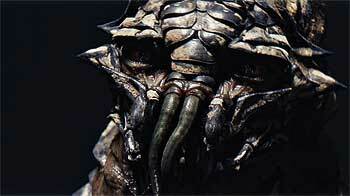 As a South African, watching District 9 has some rewards that foreign viewers wont pick up on. The pleasure of seeing accurate and believable portrayal of familiar South African people. An Afrikaans person who does not sound like a Nazi. A black South African who is not Samuel L Jackson! What a relief. I guess that my reaction to Wikus wont be shared by many none-South Africans. I did not hate him, even in the beginning, or even in the worst of the scenes when he jokingly kills infant aliens. Wikus is a marvel. He is so familiar. The key to his character – for me – is how oblivious he is to how the world sees him. He thinks that he is a nice guy. Just a regular nice guy. He has the best of intentions. His off hand racism, his self serving rationalisations. Watching Wikus figure out that he is not the good guy in this story was what lifted the movie out of its guts and gore action adventure status. One thing that really did not work for me was the stereotyping of the Nigerians. Why on earth did they do that? Again and again, we see “The Nigerians” pimping, selling drugs, smuggling weapons. We even have some cannibalism. It was like the good old days of the “Swart Gevaar”. The plot called for that interaction of humans and aliens in the township, to explore that exploitation. But why do it like this? What a missed opportunity. There is so much more to think about. The way in which Wikus’s metamorphosis into an alien starts off being just gruesome, but by the end transcends the horror. The passivity of the aliens with their super deadly weapons. Is it true that they are incapable of action without a leader, or is that just a human construct?I loved Christopher Johnson and his little son. The movie managed to get me to care about these very unappealing creatures. We very much had a script. The idea was to have a very clearly-written script and a clear idea of what the story was and the parameters that the story would happen within. Then, I got Sharlto Copley, who’s my childhood friend, to be Wikus because on a scene by scene basis he would have the freedom to become this character, and I wouldn’t box him in with any particular lines. So when you’re directing it you have to be watching to make sure that you’re sticking within those parameters and that even though he’s making it his own and going all over the place that he is hitting those story beats and the overall curve of the film is still being maintained. But yeah, we absolutely had a script that we wrote in 2007 and then modified in 2008. Yeah it really was. All the trash was real and those shacks that we ended up inheriting, people had lived in them. A couple of them were actually built on a landfill, on 25 years of trash, so when you dug into the ground as well—there’s a scene where we go into the trap door inside the alien’s shack—you go into that hole and it’s just layers of trash from different eras. It’s almost like trying to work out the age of a tree, you know you’ve got these layers of trash from different eras. So it was really filthy and I think what doesn’t come across in the film is the smell of the place and what it was like to breathe the air, particularly at night. We were shooting in winter—it’s very hot in the day and then it gets freezing at night and people are burning anything they can to stay warm, they’re burning rubber tires, they’re burning plastic bags, so the level of toxicity in the air is ridiculous. I’m still figuring out how I feel about this movie. I think its brilliant, but flawed. I love the passion that I sense in the telling of this story. It gave me a lot to think about. Masha – Thank you for this. It is interesting reading your perspective as a South-African. I also question the portrayal of the Nigerians, it seemed an intense stereotypical characterization. I can’t really articulate what I think about D9. I know I really liked it. I want to see it again and maybe will get a better handle on my feelings about it.